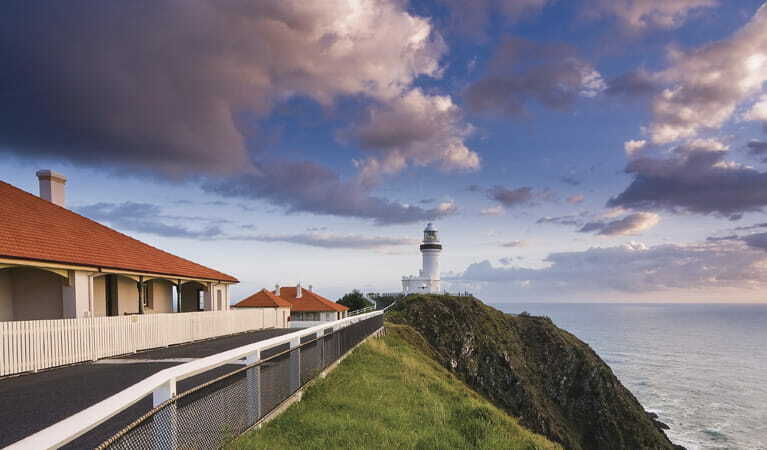 For over a century, the elegant Cape Byron Lighthouse has graced Australia’s most easterly point. Its powerful lamp still burns brightly across the bay and you can visit this historic landmark or even stay in one of the charming keepers’ cottages. If you’d prefer to be closer to the beach, there’s a choice of award-winning eco-tourism beach cottages within the park. Cape Byron is a brilliant location for whale watching and the walking track provides spine-tingling views of the surrounding coast and ocean. You can enjoy a bite to eat at the Cape Café, with panoramic views across the hinterland to Byron Bay. Spend the afternoon relaxing on the beach – try The Pass, Wategos or Tallows. If you’re feeling more adventurous, there’s great diving, snorkelling, surfing, hang gliding and kayaking – go on your own or with licensed tour operators. Buy an annual pass (https://www.nationalparks.nsw.gov.au/visit-a-park/parks/cape-byron-state-conservation-area/visitor-info#Fees-and-passes). 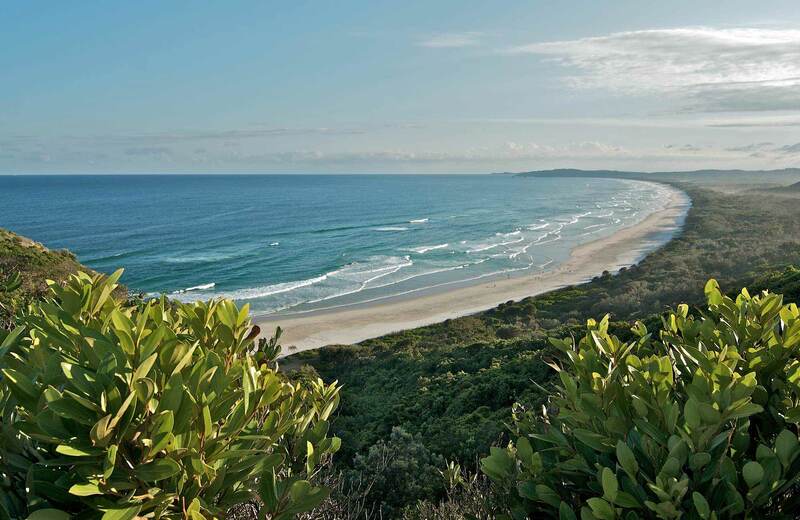 All the practical information you need to know about Cape Byron State Conservation Area. There are lots of great things waiting for you in Cape Byron State Conservation Area. Here are some of the highlights. With the weather being a bit cooler, it's the perfect time of year for walking, barbecues and picnics on the beach. Summer holidays beckon you – enjoy swimming, snorkelling, surfing, building sandcastles, or relaxing in the shade. Cape Byron is a great spot to watch for whales on their annual migration - remember to take binoculars. Byron Bay is Australia's easternmost town and 'style capital' of the North Coast. It's a place of outstanding natural beauty, set against lush volcanic hills. Bangalow is a relaxed but stylish village close to Byron Bay. It's set in lush green hills near the coast. Cape Byron State Conservation Area is part of a significant north-to-south regional corridor for migratory animals, including the fruit dove and cuckoo shrike. Locals you might be lucky enough to spot while touring the area include threatened wallabies and sea eagles. A peaceful walk through the area’s serene littoral rainforest, with plant life; such as laurel trees, white lace flowers and basket ferns, to admire along the way, is sure to further enrich your experience of the Cape Byron area. Cape Byron walking track Enjoy spectacular coastal views along the Cape Byron walking track that takes you on a hike through rainforest, beach, grassland and clifftops to the lighthouse. Wategos Beach Located just north west of Cape Byron and the lighthouse, Wategos Beach is one of Byron’s best places to picnic, paddle and play. Whale secrets Whale secrets is a school excursion in Cape Byron State Conservation Area for Early Stage 1 (Kindergarten) students focusing on HSIE. Discover the secrets of whales through a playful mix of drama, games, story and ocean discovery. Whale Secrets Whale secrets is a school excursion in Cape Byron State Conservation Area for Stage 1 (Years 1-2) students focusing on Science and Technology. Discover the secrets of whales through a playful mix of drama, games, story and ocean discovery. Walgun, as Cape Byron is known by its traditional custodians, maintains spiritual, cultural and historical importance for the Bundjalung of Byron Bay (Arakwal) Aboriginal People. The pipi midden (shell mound) at The Pass is one of the largest and oldest in far north NSW. Dolphin Dreaming Dolphin Dreaming is a Stage 1 (Years 1-2) school excursion in Cape Byron State Conservation Area, focusing on HSIE. Through story, dance and creative expression, Arakwal Aboriginal guides present the life and culture of Byron Bay's Aboriginal people. Dolphin Dreaming Dolphin Dreaming is an Early Stage 1 (Kindergarten) school excursion in Cape Byron State Conservation Area, focusing on HSIE. Through story, dance and creative expression, Arakwal Aboriginal guides present the life and culture of Byron Bay's Aboriginal people. Dolphin Dreaming Dolphin Dreaming is a Stage 2 (Years 3-4) school excursion in Cape Byron State Conservation Area, focusing on HSIE Geography outcomes. Through story, dance and creative expression, Arakwal Aboriginal guides present the life and culture of Byron Bay's Aboriginal people. Dolphin Dreaming Dolphin Dreaming is a Stage 3 (Years 5-6) school excursion in Cape Byron State Conservation Area, focusing on HSIE Geography outcomes. Through story, dance and creative expression, Arakwal Aboriginal guides present the life and culture of Byron Bay's Aboriginal people. Palm Valley Palm Valley, or ‘The Pass,’ offers well-equipped picnic areas right by the beach, plus a popular café, several walking tracks, and access to the Fishermans lookout. Walgun walk and cultural experience Walgun walk and cultural experience is a school excursion in Cape Byron State Conservation Area focusing on Stage 6 Aboriginal Studies, Community Study (Years 11-12). Join traditional custodians to learn about Arakwal Bundjalung People's ongoing connection to Country. Walgun walk and cultural experience Walgun walk and cultural experience is a school excursion in Cape Byron State Conservation Area focusing on Stage 5 History (Years 9-10). Join traditional custodians to learn about Arakwal Bundjalung People’s ongoing connection to Country. Perched high above Byron Bay's glorious coastline, historic Cape Byron lighthouse was constructed on this rugged headland in 1901. Its landmark 22m high white tower houses the light that still illuminates the bay of an evening. To find out more about the lighthouse take a tour with an expert guide and be sure to check out the Maritime Museum. In days gone by, lighthouse keepers were responsible for igniting the lighthouse's light of an evening. The keepers have long been replaced by automated light systems; however the Victorian Georgian style cottages in which they lived remain as heritage listed buildings. Today they operate as holiday accommodation, having been carefully restored to offer modern convenience while retaining their historical charm and an insight into the life of a lighthouse keeper. Byron Bay historic private lighthouse tour Immerse yourself in the history of Cape Byron Lighthouse. Imagine yourself in a lighthouse keeper's shoes on this private guided tour of iconic Cape Byron Lighthouse. Cape Byron State Conservation Area maintains and preserves the land and scenery within its borders. Visitors are able to fully enjoy its attractions as facilities and surrounding landscapes are regularly and carefully maintained. Pests and weeds have a significant impact to the ecosystems within Cape Byron State Conservation Area. Risk assessments for new and emerging weeds are carried out as an ongoing initiative within the park. Pest management of bitou bush is an important part of the work NPWS does to protect the integrity of biodiversity which exists within Cape Byron. Bitou bush poses a serious and widespread threat to threatened species populations and ecological communities on the NSW coast. The NPWS bitou bush threat abatement plan helps to reduce the impact of weeds at priority sites using control measures such as ground spraying, aerial spraying, biological control and physical removal. Cape Byron State Conservation Area is committed to developing visitor facilities for its customers’ enjoyment and safety. Regular maintenance, upgrading and installation of recreational, accommodation and retail amenities and infrastructure take place in this park. NPWS works to monitor vulnerable species and address threats, which can include feral animals and weeds, and implements actions to target their impacts. There are a number of significant Aboriginal sites and artefacts within Cape Byron Conservation Area. NPWS is committed to protecting these important cultural items, and interpretive and educational programs are ongoing in this park.